Cornelia Crater lies on the large asteroid Vesta. The inset image at right shows an example of curved gullies (indicated by short white arrows), and a fan-shaped deposit (indicated by long white arrows). Image released Jan. 21, 2015. Liquid water apparently flowed on the surface of the huge asteroid Vesta briefly in the relatively recent past, a surprising new study suggests. "Nobody expected to find evidence of water on Vesta. The surface is very cold and there is no atmosphere, so any water on the surface evaporates," study lead author Jennifer Scully, a postgraduate researcher at UCLA, said in a NASA statement. "However, Vesta is proving to be a very interesting and complex planetary body." 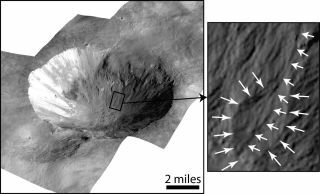 The researchers noticed curved gullies and fan-shaped deposits within eight different Vesta impact craters. These craters are young compared to the 4.56-billion-year-old Vesta; all of them are thought to have formed within the last few hundred million years. On average, the gullies are about 3,000 feet (900 meters) long and 100 feet (30 m) wide, researchers said. They bear a striking resemblance to channels carved by "debris flows" here on Earth, which occur when a small amount of water gets dirt and small rocks moving. Indeed, Scully and her team think something akin to debris flows — as opposed to pure-water rivers or streams — created the Vesta gullies. They propose that meteorite strikes melted subsurface ice deposits, sending liquid water and small rocky particles down the walls of the newly formed craters. Laboratory experiments suggest that the debris would slow the water's evaporation rate enough to allow the gullies to form, researchers said. This scenario, of course, implies the existence of buried ice on Vesta, which has not been proven. But Dawn did observe signs of hydrated minerals on the huge asteroid. "If present today, the ice would be buried too deeply to be detected by any of Dawn's instruments," Scully said in the NASA statement. "However, the craters with curved gullies are associated with pitted terrain, which has been independently suggested as evidence for loss of volatile gases from Vesta." When Dawn left Vesta in September 2012, it began a long trek toward the dwarf planet Ceres, the asteroid belt's largest denizen. That journey is almost over; Dawn is scheduled to arrive in Ceres orbit on March 6. "We look forward to uncovering even more insights and mysteries when Dawn studies Ceres," said Dawn principal investigator Christopher Russell, also of UCLA.